Finally I have managed to catch up with the world just in time for the weekend. Normita will be off on Monday so that it will be a nice long one for a change. I hope that we can manage to relax and enjoy life a bit. The following recipe is a very easy one to do, and it is one of our favorite to prepare when we are too lazy to seriously cook up a storm, but energetic enough not to be tempted to order out or walk to a restaurant for a bite. We normally prepare it with whatever fresh mushrooms we have in hand, or with a can of mushrooms if it is an emergency and we do not have anything else. The type of pasta to use is irrelevant and we have made it with about anything we have in the cupboard depending on what our mood was. Last Saturday we made it with tricolor eliches and three different types of mushrooms (button, cremini, and oyster) in equal quantities. It takes about half an hour to prepare, maybe a tad longer if your pasta is of a type that takes a while to cook. I normally prepare the sauce in the same pot I cooked the pasta, after I drained the pasta in a colander to save on washing dishes, but last weekend I wanted to try one of the new large pans, so I dirtied up the kitchen a bit more. We ended up enjoying the meal with a half decent bottle of Cabernet Sauvignon from Baja California, a local Mexican wine we found at the supermarket a few weeks back that was surprisingly decent for the price. If some of you are scared about the amount of chilies, do not worry, you do not have to eat them and we normally remove them before serving as well as the bay leaves. They are there just a few minutes to give some flavor to the sauce. Please try and enjoy this quick meal, and let us know if you liked it in the comments . Ingredients Pasta ½ pound dried pasta of your choice 3 quarts water 1 tbs coarse salt Sauce 1 tbs butter ½ tsp dried basil ½ tsp dried oregano ¼ tsp mustard powder 1 tsp brown sugar 2 cloves finely chopped garlic 5 thin red dried Italian chilies or chile de arbol 2 bay leaves 2 small or 1 large tomato roughly cubed ¾ pound roughly chopped fresh mushrooms 1 pound jar of Italian tomato sauce Salt and pepper to taste Freshly grated parmesan cheese for garnish Preparation 1. In a large pot put water and salt and bring to boil at high eat. 2. While the water is heating up chop the mushrooms roughly and reserve. 3. Place basil, oregano, mustard powder, sugar, garlic, bay leaves, and washed chilies in a small bowl. 4. When the water is boiling, reduce heat and put the pasta in it and cook according to the package until tender. 5. When the pasta is ready pour the entire pot in a large colander placed in the sink and return the pot to the fire. 6. Put the butter in the pot and when melted cook the mushrooms for 3-4 minutes until nice and juicy. 7. When the mushrooms are ready add the spices and tomatoes from the bowl and stir in thoroughly for a few minutes. 8.Add the jar of tomato sauce and bring to a simmer and when it is warmed through pour in the cooked pasta. 9. Gently fold the pasta until the sauce and mushrooms coats it well. 10. Serve after removing the chilies and bay leaves, and top with a grating of fresh pepper and some grated parmesan. The last few days were busy with work here, so posting has been light. We managed to relax a bit on Sunday, a first after many months of craziness, and the last few days have been very busy with programming work in the office. Over the weekend we also managed to baptize the new kitchen and we prepared great dishes. Those recipes will be up shortly. For now we will not be posting pictures of the cooking process as we planned. The digital camera just died on us and I need to research what is available on the local market and do some shopping for a new one. I will call it quits early tonight so that we can catch up on some relaxation. We have been going non-stop for the last few years and we really need a break. We plan to take some extended weekends off over the next few months so that we can recharge the batteries, and also to give us time to work on some new features for the site and try and enjoy some great recipes. Yesterday I went to a trade show about restaurants, bars, and hotels. They offered a wide variety of food supplies, equipment, and services for the trade. I was there for a quick run around the exhibition floor, as I only wanted to check a few things, mainly what was available locally for restaurant/bar management software. Of course I kept an eye open for dishes, glassware, and kitchen gadgets, as well as potential suppliers of foodstuff. I also spent a few minutes looking and drooling at commercial ranges as I plan to install one in our next kitchen when we move to a new house in a few years. I met with the people representing an extensive line of kitchen gadgets and knives and I particularly liked their line of commercial kitchen knives. The sales rep told me to come back a bit later, as since it was the last day of the show they were planning to sell everything at deep discounts so they did not have to bring back everything with them again through customs. We were supposed to get the last of our furniture on Wednesday evening, but, of course, the carpenter building them called us to let us know that the last coat of varnish was not drying quickly enough. He would deliver on Thursday at 9am, which ended up being Thursday at 3pm. Donâ€™t you like wasting your time waiting for trades people? We will probably post some of the first recipes to the site this weekend as we will finally have time to really cook for the first time since we moved here. Our philosophy is that we do not want to post recipes that we have not recently done in our kitchen. Most of them are originals that are favorites of ourselves and our friends, and others are some that we have adapted over the years. This is mainly for two reasons. First I do not believe that simply posting things that you find on the Internet as your own is fair, so how can people trust us if we do not actually cook and eat the stuff we present here. Like our dear friend Kurt always says, â€˜I do not trust a chef who does not eat his own food, or that is too thin!â€™. 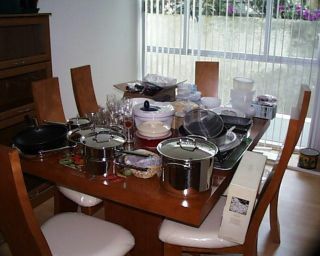 I was reminded of how many things we accumulate in the kitchen over the years while we were unpacking and cleaning all of the kitchen gadgets we got since we moved to Mexico about two and a half years ago. We had a large cardboard box full of all sorts of things, and I realized that we probably have about 10 times that in storage back in Canada. For now I have just washed everything and stuffed them in a few drawers in the kitchen, and next weekend I will go through everything and decide what I will keep and what will go in storage or be given away. Iâ€™ll make a handy list of basic kitchen essentials for those starting out with a new kitchen, or who want to do some fall cleaning. This will also help me in finding out if we are missing something important when we start using the kitchen heavily. We are finally somewhat settled in the new condo. Last Friday, with the wonderful help of Jorge and Margarita, we managed to clean the place up properly and wash all of the dishes, cutlery, glasses, pots and pans, and all the things we have for the kitchen, and then somewhat found some room for everything in its reduced space. Tomorrow night a little bar and a small furniture for the aquarium should be delivered and the last things still sitting around on the counters should be stored away. We should be able to start posting regularly in the coming days. This took a lot longer than planned, but we are now ready. Normita is out of town on business until tomorrow so her introductory post will still be delayed for a few days. I am here and frantically preparing some nice posts and tasty recipes and they will be up regularly starting soon. We do not plan to have a regular posting schedule at first, but I aim to post at least a short entry daily, and when the mechanics of production will be well oiled we will try to have a regular schedule for the posts. Hi Everybody! Welcome to our new place on the web! We’ll be online soon to discuss things that make our life enjoyable. In the meantime you can look around at our Cybermall or learn more about our wine consulting partnership at http://www.fitzcarraldoconsultants.com.